This entry was posted in rain taxi videos on February 5, 2014 by Kelly. NYC poet Joanna Fuhrman read new multimedia work at the Fox Egg gallery on a summer swing through Minneapolis, then closed with a terrific poem titled "Neon Arboretum," captured here. This entry was posted in rain taxi videos on October 3, 2013 by admin. Jessie Bennett sat down with Alysia Abbott in Boston to discuss her new book Fairyland: A Memoir of My Father (Norton, $25.95), a vivid time capsule of growing up during the 1970s and ’80s with a gay dad in San Francisco. Our full interview with Alysia Abbott can be found in our Winter 2013 Print Edition. Rain Taxi talks with Stephen J. Gertz, expert on "weird books" and author of the book Dope Menace, at the Twin Cities Antiquarian & Rare Book Fair in St. Paul. Rain Taxi caught up with Andrei Codrescu, who was in Minneapolis to read from So Recently Rent a World, New and Selected Poems 1968–2012. Codrescu spoke about the changing poetry scene, the significance of chapbooks, and what spurred his poetry in the wake of Hurricane Katrina. 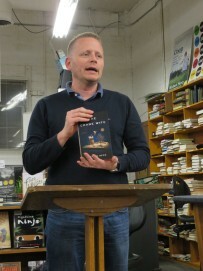 Rain Taxi caught up with National Book Award winner William Alexander at the book launch of his second book, Ghoulish Song, the follow-up YA novel to his award-winning Goblin Secrets. Alexander celebrated in St. Paul at Dr. Chocolate's Chocolate Chateau, sponsored by Addendum Books, and with music by Dreamland Faces. Here is a clip from Anselm Hollo's reading in Minneapolis in 2007. The "elegant and rowdy" poet passed away on January 29, 2013. Thank you, Anselm Hollo, for writing your poems, so many wonderful poems. Kind One, a chilling and haunting tale of redemption and human endurance in antebellum America told from the points of view of Ginny, a child bride to an abusive husband, and Zinnia, a young slave girl. This entry was posted in rain taxi videos on October 21, 2012 by admin. On a lovely August afternoon, Neal Stephenson, author of a recent collection of essays Some Remarks, spoke with Rain Taxi about the Internet's effect on the science fiction community. Read a complete interview with Neal Stephenson forthcoming in the fall issue of Rain Taxi. This entry was posted in rain taxi videos, Uncategorized on August 13, 2012 by Kelly. Writer Anne Fadiman speaks to Rain Taxi editor Eric Lorberer about her National Book Critics Circle Award winning book, The Spirit Catches You and You Fall Down, on the occasion of its 15th year anniversary and re-release. The book explores the clash between cultures as a California hospital and a refugee Hmong family disagree over the treatment for their youngest child Lia Lee. This entry was posted in rain taxi videos on May 7, 2012 by Kelly.